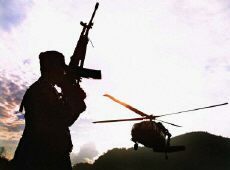 A Colombian soldier watches a helicopter land east of Medillin, March 15, 2002 (Photo: AFP). The biggest illegal arms shipment known to have arrived in Colombia landed in Turbo, a port on the Gulf of Urabá, on Colombia's Atlantic coast, last November. The weapons, enough to equip a lethal paramilitary offensive, were unloaded into trucks at the port, which has been controlled for several years by the right-wing United Colombian Self-Defense (AUC) militia. What happened to the weapons after they disappeared inland is still, officially, a mystery. But an unidentified "member of the AUC high command" boasted in the April 25 edition of Bogotá’s centrist El Tiempo that "we have fooled the authorities of four countries," and claimed his paramilitary force has the arms. A belated Colombian investigation into the matter has sparked a many-headed international scandal. The weapons, reported to include 7,000 AK-47 assault rifles, US$5 million-worth of 7.62mm bullets, and "other assorted deadly paraphernalia," were transported to Colombia in the Otterloo, a Dutch ship which recently acquired the Panamanian flag. Today, the Otterloo is in a dry dock at the port of Cristobal, at the northern entrance to the Panama Canal, undergoing repairs. Its crew has been laid off and dispersed, its captain isn't talking, and police and prosecutors in four nations are trying to follow the trail of suspicious transactions by which the weapons arrived in Colombia. The AUC, whose founder Carlos Castaño is wanted for a number of grisly massacres and who once bragged on Colombian national television that his group gets 70 percent of its income from the drug trade, is alleged by many human rights groups to be an informal auxiliary of the Colombian army. As this story went to press, the AUC was beginning an offensive around the town of Jurado, a town close to the Panamanian border that has been held by leftist FARC guerrillas, provoking an exodus of refugees who have begun to arrive in the Panamanian town of Jaque. Israeli arms merchants working out of Guatemala say the Panamanian government contracted them to buy the weapons from the Nicaraguan police. The weapons are now orphans of war---most of the suspects along the paper trail deny any connection with them. Investigators are following a trail of documents and financial records. According to one source close to the investigation, who spoke on condition of anonymity, the trail appears to lead directly back to the coffers of Plan Colombia, a sweeping Colombian program designed to end the civil war, curtail narcotics production and trafficking, and stimulate the economy. On July 13, 2000, former U.S. President Bill Clinton approved a US$1.3-billion assistance package for the plan. On Oct. 24, 2001, the U.S. Congress approved an additional US$698 million, US$106 million less than U.S. President George W. Bush had requested, for the Andean Regional Initiative, which seeks to prevent the conflict in Colombia from spilling over into surrounding countries. Panamanian President Mireya Moscoso has assured journalists that "the police never arranged to acquire these arms." But the Israeli arms dealers, Oris Zoller and Uzi Kisslevich, who---acting as co-owners of the Guatemalan company Grupo Internacional de Representaciones (GIR, S.A.), allegedly on Panama's behalf---bought the weapons that eventually made it to Colombia, insist that the import license by which they acquired the weapons was authorized by Panama's Minister of Government and Justice, Alex Vergara. "We had an understanding that the document pertained to the Panamanian police," Zoller told Guatemala City’s independent Siglo XXI (April 24). The businessman pointed out that the arms were purchased late last year from the Nicaraguan government itself and later sent to Panama. "We paid for these arms and later representatives of the National Police of Panama reimbursed us," Kisslevich said. On April 26, Managua's conservative La Prensa Nicaragua reported that Nicaraguan authorities confirmed their story. Nicaraguan Deputy Police Chief Francisco Bautista was quoted in the newspaper as saying, "The whereabouts of the weapons is the responsibility [of the National Police of Panama], who acquired the arms in Nicaragua that were later sent to Colombian guerrillas," adding that the Israeli arms dealers had been investigated by Interpol and found "serious and legal." Zoller gave telephone interviews to newspapers in the region, in which he denied the government’s claims that the documents were forged. He also faxed journalists copies of an import license signed by Panamanian officials certifying that "the arms described above are and will be exclusively used by the National Police of Panama… their final destination will be Panama City." He added that he delivered the weapons to Inversiones Digal, a Panamanian business owned by Israeli arms traffickers Shimon Yalin Yelinek and Marco Shern, who were acting as representatives of the Panamanian police, on Nov. 2, 2001. He then considered the transaction "finished." Yelinek and Shern have since denied having any contact with the Panamanian police. But no one implicated thus far could explain why the paperwork was made out to an intermediary rather than to the shipment’s ultimate recipients in Colombia. Panama City’s independent La Prensa reported on April 23 that the proprietors of GIR, SA challenged the governments of Nicaragua and Panama to verify how the arms wound up in Colombia, adding that Kisslevich and Zoller insisted they had bought the weapons at the behest of the Panamanian National Police. Kisslevich told La Prensa that the deal was "transparent" and the documentation was "legal." "We had the support of the Panamanian authorities for this operation," Kisslevich told Siglo XXI. So is Panama at war? Clearly not, but with the implementation of Plan Colombia, skirmishes along its Colombian border have increased, with incursions by right-wing paramilitaries, left-wing guerrillas, gangs of bandits, and crowds of refugees displaced by fighting or the fear of new massacres. Panama has no army, but the government has created a special police force to guard the border, and is training the police for combat if that is necessary. Panamanian sources say the U.S. government, perhaps out of fear of the Colombian civil war spreading into neighboring countries, is purchasing weapons for countries that share borders with Colombia out of its budget for Plan Colombia. Aboard the Otterloo, the boxes of AK-47s bore inscriptions showing that they came from Russia, Germany and Hungary. The April 23 edition of El Tiempo cited an earlier statement from Carlos Barés, the chief of Panama’s National Police, saying that his force buys arms from Hungary to save money. On April 25, La Prensa published Nicaraguan police spokesman Marlon Montano’s explanation of what happened: "The police were authorized by the government of Nicaragua to sign the ‘Contract of Exchange of Arms and Ammunition’ with GIR, S.A., in its role as the intermediary of the Panamanian police." Montano added that the transaction was authorized according to the legal procedures of Nicaragua, by the nation's Comptroller General's Office and Ministry of Treasury and Public Credit. He also said that the arms were delivered by police chiefs and under strict vigilance at the port of El Rama, from whence they sailed off in the Otterloo. Independent Panama City newspaper La Critica Libre (April 23) reported that the operation began in February 2000 and finished this past Nov. 10, when the Otterloo unloaded the arms in Turbo, Colombia. According to investigations, the ship is the property of Trafalgar Maritime International. The Panamanian corporation's president is Julio César Matute Oliva. Its resident agent, attorney Gustavo Leonardo Padilla Martínez, told the daily that to his knowledge, the company had not been doing anything illegal. The Panamanian government maintains that the signatures of General Services Director Rolando Taboada, Purchasing Chief Reinero Castillo, Government and Justice Ministry official Alex Vergara, and Financial Control Chief of the Comptroller’s Office Fredison Carvajal were all forged. It has admitted that the documents were on official Panamanian government forms, but maintains that the signatures were falsified. However, none of these individuals have personally admitted or denied their involvement in the arms transfers, saying the Panamanian government has forbidden them to give statements to the press. On April 23, Panamanian Attorney General José Antonio Sossa told reporters that he was waiting for reports from Panamanian and foreign law enforcement agencies to establish whether a crime had been committed within Panamanian territory, and that everything now depends on how Nicaraguan, Guatemalan, and Colombian authorities respond. He noted that he was trying to find out how the documents were falsified and which businesses were involved in the alleged purchase and resale of the arsenal, which he said was transported in three different shipments. Police Chief Barés insists that Panama never bought the arms in question, nor did it serve as a transit country for arms trafficking, but it was simply a matter of false National Police documents being used to cover the Israeli smugglers’ operation. The Panamanian National Security Council announced that the governments of Colombia, Nicaragua, Panama, and the United States would conduct a joint investigation to clarify the discrepancies. Carlos Aguilar, speaking on behalf of Trafalgar Maritime, said that the company acquired the Otterloo about a year ago. The crew is gone, save a single caretaker who is not allowed to leave the ship. Panamanian police have issued an order barring the ship from leaving Cristobal. On April 23, El Tiempo reported that after the ship slipped into Turbo harbor late at night, dozens of men began to unload its cargo. According to customs documents, two weeks before arriving in Panama, the ship had sailed from the port of Veracruz, Mexico, with 23 containers full of plastic balls in its hull. El Tiempo reports that the Otterloo called at Bluefield, Nicaragua, and then set off for Turbo with 14 containers allegedly containing 10,000 AK-47s and 15 million bullets. If El Tiempo’s count is correct, then either 3,000 additional rifles found their way onto the ship after the deal with the Nicaraguan police, or the documents securing the purchase from the Nicaraguan police were inaccurate. The load passed through the official inspections at the port of Turbo and, two hours later, several trucks filled with balls, rifles, and bullets set out on the highways of Antioquia and Córdoba. A month later, when other Colombian law enforcement officials heard about a huge arsenal’s arrival in the country, it was much too late to do anything about it: The trucks had delivered their loads and disappeared without a trace. The police created an investigating committee under the Colombian Intelligence Directorate (DiPol) to establish the origin and destination of what they believe to be the largest illegal weapons shipment ever to enter Colombian territory. The investigators heard conflicting stories. For example, the Otterloo's engine operator, Jesús Ernesto Yejún Rodríguez, a Mexican national, said that the itinerary from Veracruz to Colombia didn't include Nicaragua, and that the vessel only stopped there for repairs. And then there were the documents indicating that 7,000 rifles were loaded onto the ship, which conflicted with other accounts that said 10,000 were unloaded from it. Today we wake up to the news of arms that have entered Colombia, and the only official response is from the National Security Council, denying the grave accusations made in the Colombian media, and promising to conduct an investigation of the crime. The National Security Council is the least qualified body to conduct this investigation, because the director of the National Police sits on it. This is not only one more instance of corruption, this attacks the spirit of neutrality that Panama has advocated, and puts all of our citizens at risk of becoming involved in an armed conflict that would repeat, for our country, the horrors of the Thousand Day War. The author wishes to acknowledge the help she received from Eric Jackson, editor of The Panama News, and from Journalists Against Corruption, an El Salvador-based group dedicated to uncovering official corruption through the promotion and dissemination of investigative journalism.